1996 Acra ATC-M40 Tool and Cutter Grinder s/n 2518 w/ Compound Grinding Head, Motorized Colleted Work Head. 1996 Acra ATC-40M Tool and Cutter Grinder s/n 2513 w/ Compound Grinding Head, 50-Taper Indexing Work Head. Makino mdl. C40 Tool and Cutter Grinder s/n E43-2931 w/ Accessories. Boyar Schultz Challenger 6” x 18” Automatic Hydraulic Surface Grinder w/ Magnetic Chuck. Powermatic 4-Head Gang Drill Press w/mdl. 1150A Variable Speed Heads, 300-3200 RPM, 20” x 65” Table. LSA Technik Type ST-54 Rotary Brush Deburring System for Wheel Industry s/n IO-2001- 00011 w/Siemens SIMATIC OP3 Controls, Hydraulic Work Holding, Dust Collector. DiAcro 24” Hand Press Brake s/n J-2122 w/ Manual Back Gage, 6” Throat. 1997 Femco WT-50 CNC Turning Center s/n LE705052 w/ Fanuc Series 0-T Controls, 12-Station Turret,12” 3-Jaw Power Chuck, Jorgensen Chip Conveyor. Mori Seiki SL-15 CNC Turning Center s/n 1202 w/ Fanuc MF-T4 Controls, 12-Station Turret, HydraulicTailstock, 7” 3-Jaw Power Chuck, Turbo Chip Conveyor, Coolant. 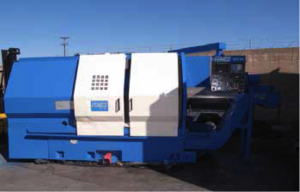 Mecca Namseon / Acra Turn 16” x 40” Geared Head Gap Bed Lathe s/n 20100385 w/ 23-1800 RPM, Inch/mm Threading, Mimik Hydraulic Tracer Unit, Tailstock, KDK Tool Post, 5C Collet Closer, 8” 3-Jaw-Chuck, 10” 4-Jaw Chuck. Hardinge mdl. HC Hand Chucker s/n HC-8162- T w/ Acu-Rite III DRO, Threading Attachment, 125-3000RPM, 8-Station Turret, Power Feeds, 5C Collet Closer, Coolant. 2006 Grizzly mdl. G9903 Vertical Mill s/n 462103 w/ Sino SDS6-2V Programmable DRO, Dial Change RPM, Chrome Box Ways, Power Feeds, R8 Spindle, 9” x 49” Table. Lagun FU2-LA Universal Mill s/n 212771875 w/ 28-1400 RPM, 40-Taper Horizontal Spindle, Compound Universal Milling Head, Power Feeds, 12” x 55” Table, Arbor and Support. Saimp Vertical Mill s/n 15264 w/ 110-2720 RPM, 35-Taper Spindle, Power Feeds, 10” Riser, 10” x 44”Table, Coolant. So-Low mdl. U80-30 -80 Degree Ultra-Low Freezer s/n 0809395 w/ Digital Temperature Controls, Chart Recorder. Dannmar “MaxJax” Portable 2-Post 6000 Lb Cap Automotive Lift w/ Acces. Hoover “Starter II” 18” x 24” Vacuum Packaging Machine s/n 1301. Robinair mdl. 17500 Refrigerant Recovery and Recycling System. (6) Spools of Manila and Nylon 2” Rope. 2001 Cummins / Onan mdl. DFHD-4956347 Spec A 1000 kW 1503.6A Diesel GenSet s/n D010223159 w/Power Command Digital Controls, 480V 3-Phase, 12-Cylinder Turbo Diesel Engine, 850 Gallon Tank, Full Enclosure, 116.3 Hours. Libby Corp MEP002A Military Style 5kW Diesel Generator s/n EZ00614 w/ Electric Start, 120-1 Phase,120/240-1 Phase, 120/208-3 Phase.Predator 4000 3200/4000 Watt Gas Generator 12VDC/120/240V.Powerhouse PH3100Ri 3000 Watt Gas Generator w/ Electric and Pull Start, 12VDC/120V. 1971 Harley-Davidson “Police Special” Service Car w/ 45 CI VTwin Flat Head Engine, 30Hp, 3-Speed Trans, Hydraulic Rear Disc Brakes, Police Siren and all Lighting, 545 Miles, Restored Basket Case, VIN#435933720. 2001 Ford F-550 Super Duty Basket Boom Truck Lisc 8W45577 w/New Motor and Trans, Versalift mdl SST37EIH 36.7’ Platform Height, 300 Lb Cap, PTO, AC, VIM## 1FDAF56S31EB93768. Hyster S150A 15,000 Lb Cap LPG Forklift s/n A024D04779B w/2-Stage Tall Mast, Cushion Tires. Allis Chalmers ACC120LPS 12,000 Lb Cap LPG Forklift s/n HJF127615 w/ 2-Stage Mast, 147” Lift Height,Cushion Tires. Towable Tater Tank w/ Pump.